For boxes with 15 probes in April. New product! Graphene grown by Chemical Vapor Deposition is a popular material with many useful properties, including light transparency and electrical conductivity. 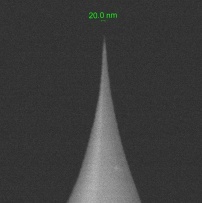 Full diamond tip with curvature radius less than 10nm at 44 Euro per tip! 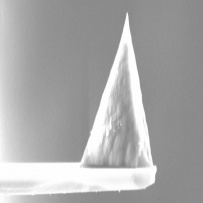 Single Crystal Diamond Probes specially designed for Nanoindentation, Nanoscratching, Lithography, resonant frequency 500-1000kHz, force constant 100-600 N/m, typical curvature radius 25nm. High Resolution Force Modulation Conductive Silicon AFM Cantilevers FMG01/Pt series with PtIr tip and reflective sides coating, resonant frequency 35-90kHz, force constant 1.0 -5.0N/m. High Resolution Contact Conductive Silicon AFM Cantilevers CSG10/Pt series with PtIr tip and reflective sides coating, resonant frequency 8-39kHz, force constant 0,01-0,5N/m. High Aspect Ratio Premium Etalon tips PHA_NC series, each chip has 2 cantilevers, resonant frequency 235 kHz / 140 kHz, force constant 12 N/m / 3.5 N/m. High Resolution High Accuracy Semicontact / Noncontact AFM Cantilevers HA_NC series with Au conductive tip coating, each chip has 2 cantilevers, resonant frequency 235 kHz / 140 kHz, force constant 12 N/m / 3.5 N/m. 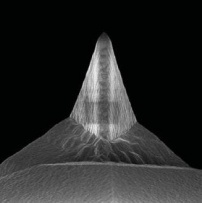 The best AFM tips for routine measurements at the reasonable price! Long Lasting Probes with Single Crystal Full Diamond tip for noncontact/semicontact modes, resonant frequency 140 kHz, force constant 3.5 N/m, typical curvature radius <10 nm. 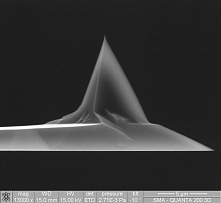 The best AFM tips for routine measurements at the reasonable price! 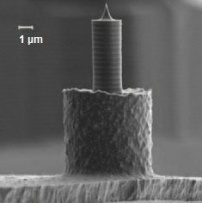 Long Lasting Probes with Single Crystal Full Diamond tip for contact modes, resonant frequency 19 kHz, force constant 0.26 N/m, typical curvature radius <10 nm. NEW! High Resolution Noncontact Conductive Silicon AFM Cantilevers NSG10/TiN series, resonant frequency 140-390kHz, force constant 3,1-37,6N/m. Al reflective coating.